It’s that time of year again. We’re bursting at the seams so we’re cleaning up and clearing out. This week we’ve purged our Fleece Artist wall. It’s jam-packed full of beautiful textures and colours – all gorgeous fibres that were too tempting to resist. Only one problem – we have too much! So this week’s special is a Fleece Artist Sale Bonanza. There’s Nyoni and Merino with Angel Hair at 40% off the regular price. Order online before May 1 and you’ll receive a gift certificate for an additional 10% of the original price. Leba and Tara are also 40% off. Leba’s a light dk weight blend of kid, wool and nylon with 425 metres to a 250 gram skein. And Tara’s a lace weight blend of the same fibres, with a whopping 2000 metres per 250 gram skein. 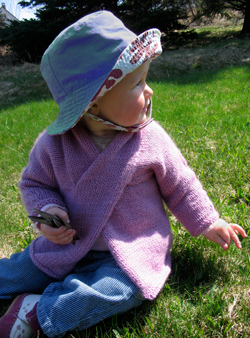 Min Kims are kimono style sweaters using 100% organic wool, in sizes 1-2 years or 3-4 years. Very cute. And there are bits and bobs of other Fleece Artist kits and yarn at 25% off like Tilting Block Sock kits and Blue Face Aran yarn, as well as select colours of Bordello Sock kits and Suri Blue yarn. All gorgeous stuff. Watch for little surprise sale baskets that will appear in our stores from time to time over the next few weeks as we continue our Spring Cleaning. This week you’ll find several skeins of the stunning Handmaiden Sea Three and Lace Silk at 15% off. And in Point Grey there’s a basket full of luscious Blue Sky Alpacas Royal at 40% off. Grab a skein of Royal and knit the Knot Hat or the newborn Royal Baby Set. Or tackle a bigger project like the crocheted Cap Sleeve Wrap or the Royal Cardigan. These beautiful yarns don’t go on sale every day so if you’re tempted, we suggest you pick ‘em up quickly before they’re all gone…. This entry was posted on Tuesday, April 28th, 2009 at 1:03 pm	and is filed under Uncategorized. You can follow any responses to this entry through the RSS 2.0 feed. Both comments and pings are currently closed.